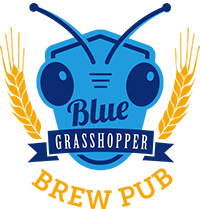 Starting out as an idea sitting in a tap room, The Blue Grasshopper Brew Pub is our dream come true. We love Beer, Pizza and Live Music and if you do, too, you’ve come to the right place! We brew, in-house, several varieties of our own hand-crafted beers. All of our beers are available on tap and in growlers. We also offer many tastes from other local breweries from around town and across the state of New Mexico.